If you own a Delaware vehicle with a warranty, beware! Many dealers and manufacturers suggest that you need to get your maintenance services at a dealership in order to keep your warranty. That simply isn’t true! You can have your vehicle serviced at your trusted, local service center without affecting your warranty. 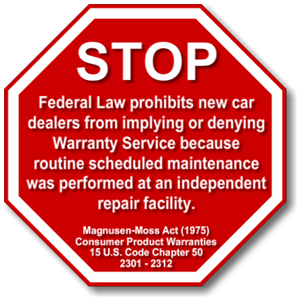 A federal law, called the Magnuson-Moss Warranty Act, prohibits a manufacturer from voiding your warranty just because you got parts or services from a non-dealer. In fact, a manufacturer can’t require you to use their brand of oil filters, lubricant, or any other part in order to maintain your warranty protection. This protection is true for aftermarket extended warranties purchased on new or used vehicles. This protection also applies to leased vehicles. There are similar laws in Canada as well. If a manufacturer can prove that the replacement parts or service lead to a vehicle failure, they can void a portion of the warranty. Of course, Buckley’s Auto Care uses quality parts and fluids that meet or exceed manufacturers’ specifications. A lot of people do not know that service centers subscribe to data services that tell them exactly which parts and fluids meet manufacturers’ specifications. These services are updated constantly so that your Wilmington automotive service center always knows what you need for your car. You can be assured that your vehicle will receive high quality replacement parts that’ll keep you safely on the road. The protection you receiveunder the can save you hundreds of dollars each year. The average hourly labor rate for service is nearly twenty percent lower at independent service centers such as Buckley’s Auto Care. We are conveniently located at 1604 E. Newport Pike in Wilmington. So why go anywhere else?